A first-person rope swinging level. 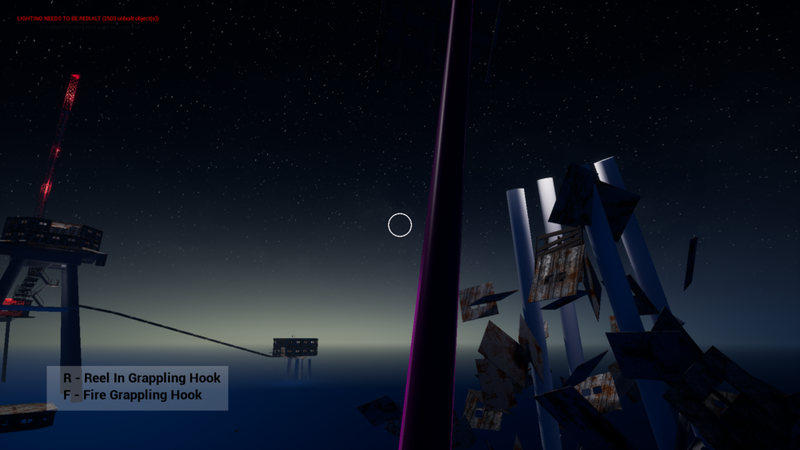 Maunsell is a test level for a First-Person rope swinging game, with original mechanics, design, and environment art. The level was made for Robert Yang's Level Design studio, in which we were tasked with making a first person level out of a real-world location. In this game world, set in the later years of WWII, the Maunsell sea forts were used to house military information and prototype weapons. You are dropped off at the bombed-out and dilapidated forts, and must retrieve the prototype grappling hook and secret documents before escaping. (1) The player initially starts out unpowered, all they can do is walk across the unstable bridges. (2) The central building offers a landmark, as they are lead to the southeast fort which houses the grappling hook. (3) The documents are housed in the west tower, but it is out of reach of the grappling hook. 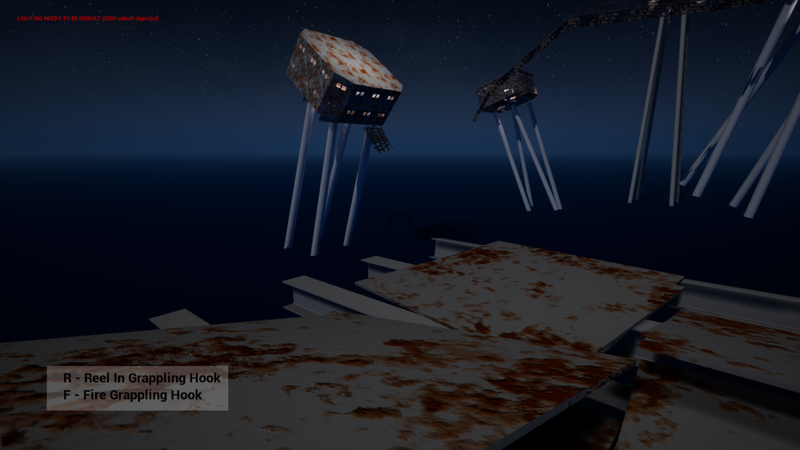 The player can either trek back to the central platform, or use momentum to swing themselves from the southwest tower. (4) Once they retrieve the dossier, they return to the central fort. (5) From here, they have a series of fort-hopping challenges, as the unstable buildings fall apart beneath their feet. (6) This culminates in a final ascent to the extraction point at the top of the eastern-most fort. I attempted to initially remain faithful to the source location, but as I iterated on the rope swinging mechanic, it became clear that a realistic sense of scale was not going to work with the mechanics that I was creating. I attempted to find a middle ground in making sure the constituent components (stairs, walls, windows), as well as the individual forts themselves, were relatively true-to-life, while exaggerating the differences distances between the forts and increasing their number. As this was my first time with Unreal, as well as my first time modeling environments in Maya, scope was a constant concern. Interiors that were made in the grey-boxing phase required more assets than I could produce, so I ended up making the forts with a limited number of grid-based pieces, inspired in part by the kit-based process used by Bethesda in Fallout 4 and Skyrim. This allowed me to iterate on the art pass without having to completely rebuild the level. Additionally, I was trying to maintain a sense of excitement without the use of NPC's or combat, which I accomplished through the dramatic (albeit unrealistic) collapsing fort events later in the level. Surprisingly, initial playtesters were able to complete the level in reasonable time with no outside help. This changed, however, when I swapped out the high-contrast placeholder keys and doors for more realistic props and textures. I ultimately removed the keys, as they weren't serving any compelling gameplay purpose, and drew attention to mission objectives through the use of lighting.